The Cuisinart ICE-70 ice cream machine truly represents what summer is all about; sweet treats, lazy days, and barbecue. It’s the time of the year where we don’t worry so much about counting calories and eating right. We’ll get back to that in the fall. For now, we’ll let our hair down and enjoy the season. The 13 pound Cuisinart ICE-70, measuring 9.7 x 8.6 x 13.2 inches, is a new ice cream machine that boast upgrades over previous models. We’ve dug deep into this machine to discover what is has to offer. Below, you can read all about this ice cream maker. We’ve owned our share of ice cream machines, to include the yonanas, and we’ve even used the Vitamix to make ice cream and sorbet. The sorbet turned out good, but I didn’t like the texture of the “ice cream” made using the Vitamix. I’m very particular about ice cream texture. In the past we also owned a traditional ice cream maker, an old school – hand crank model. We gave it away. Although it worked well, it wasn’t very convenient, and for that reason we didn’t use it very often. The Cuisinart ICE-70 is different though. Unlike the flawed machines (Vitamix only comes up short when making ice cream) I listed above, this one is more complete. This machine has multiple features for different frozen treats; frozen custard, sorbet, ice cream, gelato, and frozen yogurt. It creates a smooth textured ice cream that you don’t have to work hard for (imagine hand-cranking for ice cream). You just put in the ingredients and the machine does the rest of the work for you. The Cuisinart ICE-70 has many features and several improvements over its predecessors. There are 3 settings with multiple speeds. The countdown timer has an auto shutoff feature. You can easily keep track of the time remaining time with the obvious lcd screen. The paddle has been improved to make processing speed quicker. 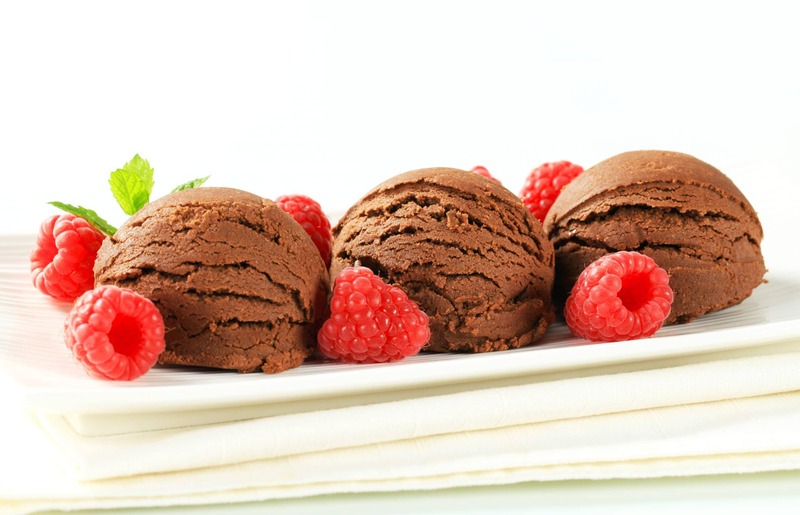 Scoops of chocolate ice cream with fresh raspberries. Atop the list of the many benefits to owning an ice cream maker are the alternative recipes available to vegans and lactose intolerant people. With this machine, they can enjoy the smooth creamy cold delicious ice cream at a fraction of the cost of those expensive store-bought creations. Ingredient conscious parents will be happy to own this ice cream machine because it’s easy to use. This model comes with a decent 3-year limited warranty. I always say that there is no such thing as the perfect machine, though this one seems pretty close. The most consistent complaint is the noise. You can hear it if you are in a different room. This could be annoying considering that your ice cream could run for 25 and 50 minutes before it’s done. Another complaint is that the two quart bowl is too small. As there is no compressor, you need to freeze the bowl 24 hours in advance. What if you want to make different types of ice cream on the same day? What if you forget to freeze the bowl 24-hours in advance, but you still want ice cream? If you care about any of that stuff, then are better options for you. But if you understand the limitations then this could be the right ice cream maker for you. The Cuisnart ICE-70 is a decent looking machine, if a bit on the basic side. It won’t knock your socks off, but brushed chrome finish certainly won’t look bad on your countertop. If you make ice cream very often, then perhaps you’ll make it a permanent fixture on your counter. I think that the Cuisinart ICE-70 is a quality machine and a very good buy. However you might have some reservations, in which case you can check out the competition below. The Cuisinart ICE-30BBC is a proven winner. It has a variety of reviews. Many customers are satisfied with this ice cream maker and there are also customers with some complaints. The Cuisinart ICE-30BC has been around the block a time or two. Of course the newer Cuisinart has the upgraded features like lcd screen and auto shutoff. If I were deciding between the two of these ice cream makers, I’d probably choose the Cuisinart ICE-70 for the upgrades. It offers more convenience than the 30bc, but it isn’t completely automatic, for that you might want to consider one of the ice cream machines seen here. The Cuisinart ICE-70 is a quality ice cream machine. It has the modern upgrades and features that improve on the convenience and ease-of-use for ice cream makers. It comes at more of a premium than some prior models, but I think that it is worth it. But it is still missing an important feature that separates it from the top dogs of the home ice cream makers; a compressor. You can check out some ice cream machines with compressors here.